"Florida was ranked the number one fiscally responsible state in 2017, but perhaps its practices are worth reevaluating." Our team of auditors at OpenTheBooks.com found nearly 35,000 state and local government employees in Florida brought home six and seven-figure salaries, costing taxpayers $5.5 billion annually. 717 small-town, city, and village employees – including 26 local administrators out-earning every U.S. governor at $180,000. 2,484 State of Florida employees – including $276,000 for Commissioner of Education Pamela Stewart; $218,925 each for Department of Children and Families Medical Executive Directors Josefina Baluga and Steve Brasington. 13,305 college and university employees – including Vice President of Health Affairs David Guzick ($1.2 million) and Director of the Graduate Tax Program Martin McMahon ($780,392) at the University of Florida. Not even resignations and retirements can stop some public employees from receiving huge payouts. Bruce Pelly, Palm Beach County’s airport director, pulled in $236,768 in 2017 on top of the $70,968 in annual retirement checks. Pelly worked for more than 20 years before "retiring" in 2010 to collect a $304,000 lump sum payout. Just 30 days later, he was rehired in the exact same position. 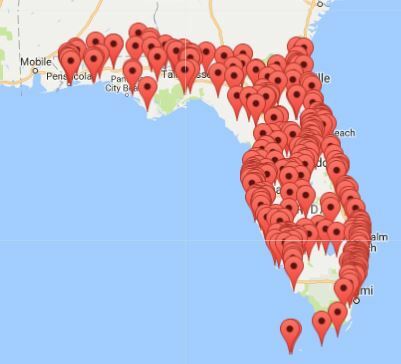 Search all six-figure public employees in Florida by zip code! Using our interactive mapping tool at OpenTheBooks.com, quickly review (by zip code) every Florida public employee who made a salary of $100,000 or more in 2017. Just zoom in, click a pin (zip code), and scroll down to see the results.